To my pleasant surprise I found that some people are actually reading my blog! So, in this post I will continue the topic touched in the last post, similarities and differences between chess and life (or chess and business, in that matter). Last time I was a little bit lame, I only scratched the surface of this topic, so now I will elaborate a little bit on this issue. For me, as a chessplayer, it's always intriguing when I find some expert from some other field who uses chess analogy to illustrate his point. 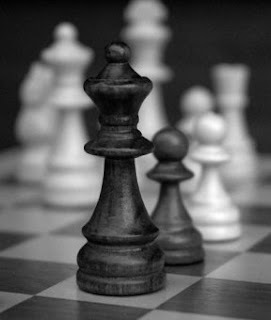 Good example is field of strategic management, in which words and concepts such as "strategy", "tactics", "resources", "planning" are abundant, and yet those same terminology is central to chess theory, especially concepts of strategy and planning. One nice little anecdote from chess world, I found many times in business litterature is story about renowned grandmaster who "played an exibition match against a New York amateur - and lost. The champion was renowned for his chessboard strategy . his ability to plan a dozen or more moves ahead as a game developed. At the post-match press conference the amateur was asked how many moves ahead he had planned in defeating the master. 'Only one,' he replied. 'The right one.'" And, many times the companies who were planning a lot in advance were beaten by those who saw only one move in advance - the right one. Puting strategic management aside, the other discipline that uses chess as an interesting field of investigation is decision making. I have read several researches in this field that have used chess players in experiments regarding decision making process, making correlations and conclusions about decision making in time-pressure situations. It's quite logical, since in chess you have limited amount of time to make a lot of decision during one average game. Psychologysts also took interest in chess, and vice versa. Nothing to surprise us, since it's one important aspect of the game, a lot was written about importance of talent in chess, cognitive process of thinking, personality of chess players and so on. And, I cannot resist to tell another joke about one famous grandmaster (not the same one as in the previous example) who "was playing a simul in the Mental institution in New York. He made pretty good result but some tall guy was playing absolutely brilliant and has demolished the Grandmaster. At the parting Grandmaster congratulated to the winner once again and this one said: 'Mister Evans. For one it's not indispensable to be crazy so he could play good, but it really helps alot.'" Nevertheless, one should not go too far in drawing parallels between chess and live. One very important dimension is the social one. Chess is a zero-sum game, you win or lose, or you can share a point with your opponent, but you can take the whole point or share it, you cannot make it bigger and than distribute id. There is little space for cooperation, making consensus, making coallitions or lobbying, and this is one of the fundamental building blocks of social space. Chess is good in illustrating competitive situations when you are trying to outsmart your opponent, but sometimes you don't know who is your oppononent, and sometime you don't need to outsmart him, and most of the time it's more important who are your friends. And, with those thoughts I will conclude this post. This was not intended to be chess-blog, but I'm glad that I have captured attention of some internet-dwellers, I hope you will follow me in the posts that will come.